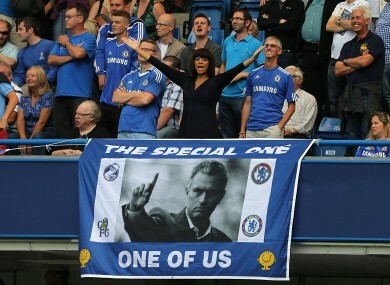 Jose Mourinho was given a warm reception at Stamford Bridge today. Crystal Palace boss Ian Holloway was not happy after seeing his side lose 1-0 to Spurs this afternoon following a controversial penalty decision – perhaps a result of his recent insistence that he would refrain from being funny this season, as he’s “not a comedian”. Nevertheless, the decision itself to award Tottenham a penalty seemed an entirely reasonable one. Dean Moxey’s arm was needlessly outstretched during the incident in question, as Aaron Lennon’s attempt at a cross deflected off the Palace player’s hand. And even if it had been the wrong decision, for Holloway to effectively accuse referees of holding a bias against sides such as his seems grossly unfair. 2. Should retrospective action be taken against divers? Most football commentators and analysts have been complaining about diving for decades now, but the authorities seem unwilling to deal with the issue in anyway. During today’s game between Chelsea and Hull City, a blatant Fernando Torres dive led to a free-kick which was subsequently supremely executed by Frank Lampard to put Chelsea two goals clear – so essentially, a key moment of the game was instigated by cheating. Tony Pulis last season condemned such behaviour, but few others in positions of power have spoken about it with any real conviction. Players will thus continue to exploit the fact that diving will likely result in a meagre punishment, so why not at least increase the risk in doing so by implementing retrospective action in cases as obvious as the one seen today. Notwithstanding the Gareth Bale saga, Spurs fans have adopted a largely enthusiastic attitude amid the start of this season. The club have made a number of intriguing signings, with manager Andre Villas-Boas undoubtedly hoping these new arrivals will offset the (likely) departure of their Welsh star. Yet while they beat Premier League newcomers Crystal Palace 1-0 today, the performance was nowhere near as convincing as ones delivered by at least two other top-four contenders – United and Chelsea. Nonetheless, that is to be expected, given the wide-scale change that has taken place within the Tottenham squad, with newcomers such as Nacer Chadli and Roberto Soldado clearly needing time to adjust to the demands of the Premier League. When asked who would win the Premier League this year, a substantial number of football pundits placed Chelsea as favourites. Others, however, might be forgiven for thinking such predictions were unwarranted, given that the London club finished a full 14 points behind Man United last year. Nevertheless, there was a discernible feel-good factor at Stamford Bridge today, amid the return of fans’ favourite Jose Mourinho as manager. And the side consequently recorded a comfortable 2-0 victory over Hull, living up to the heady expectations that have been thrust upon them, and playing with the type of panache that suggests they may well have what it takes to produce a genuine title challenge this year. Not for the first time, Graeme Souness was more than a little cloying in his analysis of Jose Mourinho. When describing Mourinho, the Sky Sports pundit talked of how “emotional” Latin people are. He was explaining, not unreasonably, that the Portuguese coach needed to receive the type of love and appreciation he was rarely afforded at Real Madrid, and was unhappy there as a result, yet he made this point in an extremely clumsy manner. Reducing a significant number of people to one particular characteristic is offensive and should not be regarded as acceptable by Sky or anyone else. Souness is an entertaining and often insightful pundit, but he needs to cut such lazy clichés out of his analysis.